I'm a LONG time customer and would love to see the DDR4 in tracers as well. Along with their awesome support of PDXLAN, they are what drew me to use their memory exclusively in all my systems. I really miss the tracers. Too bad we can't have some sort of response as to why they won't make them. Unfortunately I finally caved in and went with the Corsair Vengeance LED series, after waiting over a year before starting a new build. Still waiting here. Some sort of reason why they can't/won't would be nice, but I'm still an exclusive memory customer. Surprised they aren't moving on this. Everything else is RGB, including other's RAM. Its not just the LEDs, there's also the ability to read out temperatures etc., but I think other manufacturers are starting to offer that as well now. Still, I would like to get Crucial memory if possible. Would just like to say... Corsair Vengeance LED memory is good enough and pretty enough to look at, but its not the Tracer module i'm still looking for. Please dont leave it so long before you update the Tracer series to DDR4 that your competitors get in before you. Hello all. I just recently installed 32gb (8x4) on my system and I LOVE them. I was pinning for them for a long time and finally grabbed them up. I've always liked Crucial's implementation more than Corsair's and Avexir's (super gaudy). Later on G.Skill came out with the pretty nice Trident Z but still not exactly what I want. I liked how Crucial's actually showed activity more than just "flashiness". Always inspired a kind of old-school mainframe vibe to me or something like the Connection Machine 5. The software is just fine too; I like all the options and it seems more direct than all the other software I've read about, especially the constant issues with the Trident Z. I also really like that there is a temperature sensor. I love info like that. But anyway, I noticed at Computex than you guys are coming out with new DDR4 Tracers and I just want to say, don't mess with the awesome formula! I'd love just a DDR4 platform without too much change. RGB is the trend, so that's fine and understandable. And more options in the software would be great, like "always on" and more pattersn. But please keep the really great ACTIVITY showings. That's the main reason I love Crucial's implementation above all the others. I believe the others now like the Z can show activity and things like temp (change colors based on it) but it's still not quite the same as how the Tracers have them. I want them to still be in a similar visual representation like an HDD activity light or NIC activity light, etc (as a choice in software). Thank you guys for making an awesome product, which was really quite rare and unique for a while. I would also like to emphasise your point about ACTIVITY based lights being so much more appealing than just bling based lighting. To whoever is listening, please please please, give people choices, and the option to have bling based fixed pattern lighting, but please do not take away the option to base the lightshow on pure module activity. Its why i bought my very first Tracer module all those years ago, and i'd like to buy more in the future. 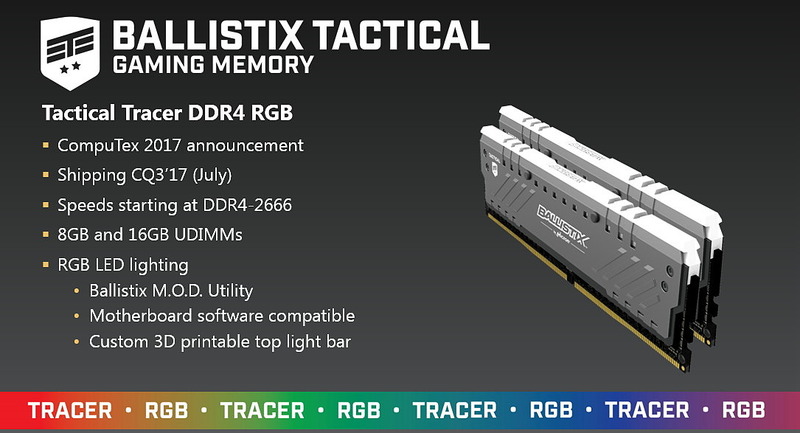 So much so, that i'm happy to ditch my Corsair memory and buy the new Ballistix Tracer DDR4 modules instead! Thanks Crucial, I'm happy now. ... any news on this? They are not longer listed on the ballistix gaming site (you need to search the site for "rgb" to find them). Were they delayed or cancelled at all?